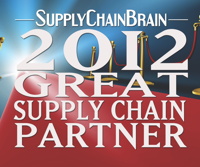 Brantford, Ontario, August 15, 2012 — Systems Logic is honored to announce being awarded Top 100 Great Supply Chain Partner 2012 by Supply Chain Brain. Every year for the past 10 years, Supply Chain Brain has allowed and encouraged supply chain professionals to nominate vendors and service providers whose solutions have made a significant impact on their company’s efficiency, customer service and overall supply chain performance. “Nominations were received for hundreds of trading partners in every aspect of supply chain management. The 2012 July/August issue of Supply Chain Brain magazine was impressed that their customers took the time to write and let us know” — Brad Berger, Publisher of Supply Chain Brain. the world’s most comprehensive supply chain management information resource, is accessed year round through a wide range of ever evolving multi-media formats by hundreds of thousands of senior level industry executives. In addition to addressing the fundamental principles of supply-chain management, Supply Chain Brain identifies emerging trends, technologies and best practices, forward thinking ideas and cutting-edge solutions ~ and continues to write and report about these as they evolve and mature.